This is one authentic dish of south India. Sorekayi is bottle gourd and hesaru bele is moong dal in kannada. 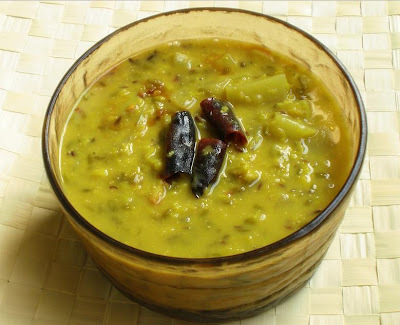 The two key ingredients of this recipe are bottle gourd and moong dal (I used split green gram dal). Both are highly nutritious. As for the bottle gourd, the cooked vegetable is cooling, diuretic, sedative and anti­bilious. I found a very interesting article about gourds HERE. Moong dal is rich in protein and next best to soy. A wonderful protein substitute for vegetarians. Since I have egg and soy allergy, moong dal is one nature's gift to me for a good protein substitute. It is very easy to prepare. Goes well with chapathi or rice, or can be relished like a soup. Here is the recipe. I have used bottle gourd in this recipe. Chayote squash (chow chow) or cabbage can be substituted in the place or bottle gourd. finely chopped carrots and beans can be added to this kootu. Desiccated coconut can be substituted for fresh coconut. I used two tablespoons of powdered dry desiccated coconut available in the Indian grocery store. Peel the bottle gourd skin and chop the vegetable into small cubes and add it in water as and when you chop. Otherwise it will turn brown. Heat oil in a heavy bottomed kadai. Add the mustard seeds, urud dal, curry leaves and red chillis. When the mustard pops, add the chopped bottle gourd and mung dal. Add 3 cups of water and allow it to boil. When it starts bubbling, add the salt, turmeric powder and asafoetida powder. Keep it partially closed and let the content cook until the dal is mushy and the vegetable is tender. Stir occasionally. When it is done, add the ground coconut and let it boil for a minute. The kootu is ready. Turn down the heat completely. Serve with steaming white rice or as a side dish for chapathi. This is my entry to VOW - bottle gourd hosted by Pooja of My creative ideas. Thank you Pooja for hosting this event. I am sending this entry to Eat healthy - Protein rich event hosted in Art of Indian cooking. Sangeeth, I have used moong dal which is protein rich. Thank you for hosting this event. Never had this before Mythreyee. The recipe is so tempting i want to try it just now :) . thanks a lot for sharing this with us dear. this looks delicious... feels like comfort food! Hello, We are inviting you to VOTE for The BEST HYDERABADI BLOG 2008. YOUR VOTE Will Help us find the TRUE COLORS OF HYDERABAD Bloggers. Why is it called Sihi Kootu?Do we need to add sugar or jaggery to this?? my guess, it got its name because we use only sweet vegetables like chayote, carrot, cabbage, etc which are normally sweet and are steam cooked. not roasted.